The Bible is full of promises. Yet one that tends to be overlooked is this promise: “If you listen carefully to the voice of the Lord your God and do what is right in his eyes, if you pay attention to his commands and keep all his decrees, I will put none of these diseases on you which I have brought on the Egyptians, for I am the Lord who heals you,” Exodus 15:26 (NIV). Is this relevant for us today? We who live in an unprecedented time of scientific and medical advances? A time when many diseases of the past have been totally eradicated? What were the Egyptian diseases? How interesting that heart disease, cancer, and diabetes so prevalent today could find its counterpart 3,500 years ago in ancient Egypt! Separated by three-and-a-half millennia, what would account for the fact that identical diseases were found? Could it be that the ancient diet of the upper class, rich in meats, delicacies, and fats, is the same diet that has made rapid forays into the contemporary Western diet? A diet that has recently experienced enthusiastic global consumption? What are God’s commands and prescriptions? God said if we pay attention to His commands He will not put any of these diseases on us. Now let’s look at one of these commands. Leviticus 3:17: “This is a lasting ordinance for the generations to come, wherever you live: You must not eat any fat or any blood” (NIV). What kinds of food have fat and blood? Animal foods. God told the Israelites not to eat fat and blood. This text says it is a lasting ordinance. Another translation (The Living Bible) says it is a Permanent Law, a rule to be kept forever. One may think that this is an ordinance for the Jews only, but actually it is for all people. God loves everyone and that includes all of us. While wandering in the wilderness, the Israelites craved for the meats they had in Egypt. They complained day and night. Finally God gave in to their mumbling and grumbling and sent in quails that covered the entire camp (Exodus 16:12, 13; Numbers 11:31-33). Ecstatic, the Israelites caught the birds and ate to their heart’s content. Gorging themselves brought disastrous results. Many got sick and died. God did not want them to eat fat and blood. What then did God want them to eat? In the first book of the Bible, Genesis 1:29: “Then God said, I give you every seed-bearing plant on the face of the whole earth and every tree that has fruit with seed in it. They will be yours for food.” Seed-bearing plant and fruit with seed — seeds have life. They are living foods. The original diet God gave our first parents Adam and Eve consists of grains, beans, nuts and fruits — these foods contain seeds rich in vital nutrients and live enzymes. The couple were vibrant, strong, and of keen intellect. They had none of the Egyptian diseases nor suffered our present day health problems. In the recent decades, medical and nutritional scientists are recognizing the superiority of a whole foods, unprocessed, plant-based diet originally provided by our loving Creator. What are the common killer diseases today? Regarding heart attacks and cancers, the National Heart Institute and National Cancer Institute have indicated that much of these diseases are diet-related and are preventable. Unfortunately, our health care emphasis is on treatment, with very little on prevention. How good are the treatments? The statistics cited above — 1.2 million deaths from heart attacks and 600,000 from cancer annually in the United States — do not reflect well upon treatments. Treating symptoms rather than targeting the cause is like the futile attempt to stop a flooding floor by mopping while ignoring the running faucet. 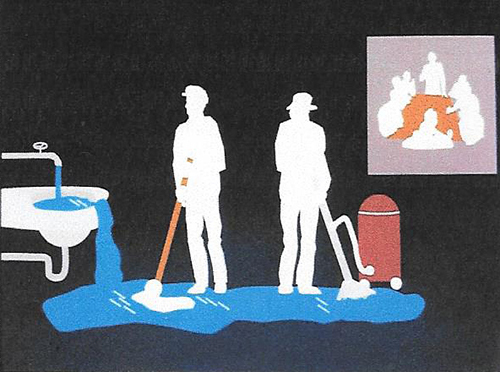 Figure 1 (below) shows two men struggling to deal with the flooding waters with a mop and a mechanical pump, all the while the open faucet continues to pour out water. Both of them look at the open faucet but did not think that is the problem. It would be too simple. The inset shows a committee meeting trying to come up with more efficient pumps. Treating the symptoms rather than the cause results in poor outcomes and unnecessary loss of lives. 1. Phytotherapy is a nontoxic chemotherapy that selectively destroys cancer cells while doing no harm to normal cells. That is to say that in the whole plant-based diet, it contains anti-cancer molecules that target just the cancer cells, and yet protect and nourish the healthy normal cells. 2. Phytotherapy is immunotherapy. Plant-based foods provide thousands of phytonutrients that feed the immune cells, strengthening their function to kill cancer cells. 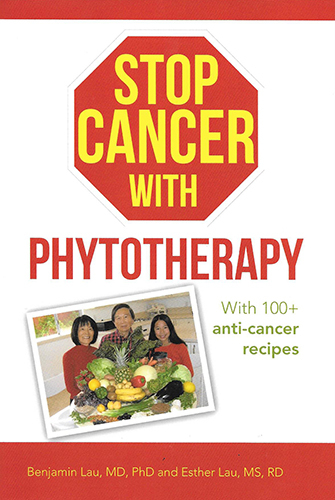 In 2014 we published a book Stop Cancer with Phytotherapy5 (Figure 2) which presents recent research findings of the powerful role of a plant-based diet in defeating most cancers. The clarion message in the book is this: Regardless of treatment choices (surgery, chemotherapy, radiotherapy, or no treatment), a change in diet and lifestyle is absolutely essential to stop cancer. And not just cancer — heart disease, diabetes, and other health issues will also benefit by an unprocessed plant-based diet. And of course, such a diet has powerful preventive and protective functions as well. We would like to share three statements Mrs. Ellen G. White wrote in her book Counsels on Diet and Foods. On page 404: “If meat eating were ever healthful, it is not safe now. Cancers, tumors, and pulmonary diseases are largely caused by meat eating.” On page 356: “Teach people to prepare food without the use of milk or butter. Tell them that the time will soon come when there will be no safety in using eggs, milk, cream, or butter, because disease in animal is increasing.” The book was first published in 1902 — 117 years ago. On page 328, she spoke of the detrimental effects of sugar: “Milk and sugar clog the system, irritate the digestive organs, and affect the brain. Sugar, when largely used, is more injurious than meat.” In recent years, science has confirmed the validity of her statements again and again. While much in life is outside of our control, what we put into our bodies is within our control. Choose wisely what goes into the body. One simple way is to take time to read the list of ingredients when buying groceries, particularly the packaged, canned, boxed, or bottled items. Most processed items contain milk, eggs, and sugar — a deadly combination. Spend more food dollars in the produce aisles for fresh fruits and vegetables. As much as possible, use the fresh produce in their natural, unadulterated state. Include a rainbow of colors in your selections. Not only are they pleasing to the eye and bursting with flavor, but their health benefits cannot be touted enough. Although a dietary change to grains, beans, nuts, fruits, and vegetables may take some initial adjustment, it actually is a return to what food should be — wholesome, pure, sustaining, and nurturing to our body, mind, and spirit. This brief anecdote illustrates the dramatic difference in outcomes of two different types of food. Our neighbor, Mrs. G., was a gracious, charming lady. Shortly after losing her husband, she was diagnosed with dementia/Alzheimer’s disease. Ann, a young lady hired to care for her, provided her with loving care along with nutritious, plant-based meals. Amazingly, Mrs. G. regained her memory and her previous kind, gentle ways. However, every weekend her children would take her to their home where she was treated with sweets and other rich foods containing milk, eggs, and sugar. Upon returning home on Sunday, she would become confused, agitated, and even violent. Patiently Ann would try to soothe her with massage and hydrotherapy while continuing to provide the nutritious plant-based meals. By Wednesday Mrs. G. would calm down, and by Friday she returned to her usual high functioning self, only to repeat the pattern of the weekend. After witnessing such an endless cycle, Ann was convinced that the weekend diet contributed to the dementia. Yes, illness comes as does death in this imperfect world. But the myriad of seemingly small choices we make daily can do much to reduce our chance of illness and to improve our lives and our ministry. We can choose to live a healthful balanced lifestyle designed by a loving Creator, and a meaningful relationship with Him and with others. In so doing we can rest in His promise for a more abundant life here and, most importantly, for life throughout eternity. 1. Thomas Maugh, Los Angeles Times, November 12, 2009. 2. E.J. Benjamin, et al. “Heart Disease and Stroke Statistics — 2018 update; a report from the American Heart Association.” Circulation 137 (2018):e67-e492. 3. National Cancer Institute. “Cancer Statistics 2017.” www.cancer.gov. 5. WestBow Press. A Division of Thomas Nelson & Zondervan. 2014. 6. P. A. Baghurst, et al. “A case-control study of diet and cancer of the pancreas,” American Journal of Epidemiology 134 (1991):167-179; S.C. Larson, L. Bergkvist, and A. Wolk. “Consumption of sugar and sugar-sweetened foods and the risk of pancreatic cancer in a prospective study,” American Journal of Clinical Nutrition 84 (2006):1171-1176; H. Liu, D. Huang, et al. “Fructose induces transketolase flux to promote pancreatic cancer growth,” Cancer Research 70 (2010):6368-6376; N. Keum, D.H. Lee, N. Marchand, et al. “Egg intake and cancers of the breast, ovary and prostate: a dose-response meta-analysis of prospective observational studies,” British Journal of Nutrition 114 (2015):1099-1107. 7. P. K. Mils, W.L. Beeson, R. L. Philips, and G.E. Fraser, “Cancer incidence among California Seventh-day Adventists,” American Journal of Clinical Nutrition. 59 (1994):1136S-1142S. Benjamin Lau, MD, PhD, is emeritus professor at Loma Linda University Medical School, and Esther Lau, MS, RDN, is a registered dietitian and nutritionist. The couple resides in Loma Linda, California, U.S.A.
With two family members with Alzheimer’s , I have authenticated aggressive, belligerent, unmanageable behavior after high carbohydrate, starchy, sugary meals. Eliminating all grains, sugars, rice, pasta and potatoes results in docile pleasant behavior. ALL rice, white and brown, is now contaminated with arsenic and should be avoided! Recently we have been eating out at a Mexican restaurant finding their beans, guacamole and salads to be healthful, but none the less noticed deterioration after each restaurant meal. prepared foods, whether in boxes, cans or bags is SUSPECT for additives. Even fruits and fruit juices though seemingly healthy, are often too high in sugar for cancer patients (. sugar is a fertilizer for cancer cells ) and for Alzheimer’s patients ( Alzheimer’s is now thought to be a diabetes of the brain with an intolerance of blood glucose spikes ). The one super fruit is BLUEBERRIES , loaded with polyphenols and flavonoids. We buy the COSTCO. organic frozen brand which is usually the cheapest. And aim for at least a cup or two per day. Not all vegetables are created,equal. and the cruciform vegetable family — Brussels sprouts, cauliflower, broccoli, cabbage, kale, bok choy and radishes. I have metastatic prostate cancer but astonish my urologist / oncologist with low PSA levels since I max out on leeks and Brussels sprouts and onions — all known to exterminate prostate cancer cells. prostate cancer — use this dietary preventative. The same vegetables are also contra breast cancer. Horseradish , a member of this cruciform vegetable family, has incredible anti cancer activity — eat one tablespoon of the sauce each day. The carotenoid family, pumpkin, carrots, butternut squash are also anti cancer. as are those containing LYCOPENE. — tomatoes, watermelon , pink grapefruit . Ellen White’s condemnation of coffee was one of her misjudgments. This beverage whether filtered, espresso, or decaffeinated, is loaded with health giving entities. Two or more cups a day are hugely cancer preventative — the statistics do not lie . Coffee is also anti Alzheimer’s and prevents a host of other illnesses —but please do not add sugar to this beverage! The only downside to a plant based diet is the complete absence of VITAMIN B 12. I had an aggressively vegan Adventist aunt who developed dementia due to lack of this vitamin. OMEGA 3 Fatty acids are lacking in vegan diets also. For a while I added Pacific wild caught Alaskan salmon — also skinless / boneless sardines from Trader Joe’s and Costco to my daily diet. More recently I am worried about MERCURY AND PCB contamination of all seafood. So now I take the purified forms in fish oil / kirill oil in gel form pilules - from Costco. and only now are they starting to outgrow themselves. I also got Kale, Leek, and several kinds of Lettuce. Good stuff. All “powered” with lots of manure! Even plants nowadays are not safe to eat. Pesticides, GMO, artificially-induced flower for fruits are some measures made by man to increase his profit. Remember Paul when he said " the love of money is the root of all evil". True but what’s the alternative? Growing your own if you’ve got the chance or buying organic reduces risk. Even if you buy commercially grown produce, I would guess that by and large it’s still way better than lots of other stuff (junk food, animal products etc.). Due to bioaccumulation and biomagnification sprayed plants seems better than the animals which eat them. From a scientific perspective people’s fear of sprayed plants is exaggerated compared to other risks we regularly incur without blinking an eye. We are more scared of sprayed veggies than of moulds which produce mykotoxins on grains. That being said I try to grow some of my own food and consume a diet rich in plants. We studied surgery, radiotherapy, chemotherapy, and immunotherapy. All these modalities were found to destroy cancer cells but often only temporarily, and sooner or later cancer returns. We also studied phytotherapy and found it to have better results. In the early 1900s, Dr. (honorary degree) Royal Raymond Rife, carrying on with Tesla’s recent discoveries regarding the wireless transmission of energy, used the sound and electromagnetic spectrum to both ‘light-stain’ tissue samples for use in his universal microscope, and to disintegrate virus cells for cancer, TB, etc. as he watched through his universal microscope, and recorded the exact frequencies that were successful for various diseases. Dr. R.T. Hamer, a graduate of the Loma Linda ‘College of Medical Evangelists’ working at Paradise Valley Sanitarium, used Rife’s ‘beam ray’ machines successfully to cure patients. One terminal cancer patient was cured by the use of Rife’s equipment by Hamer, and returned to Chicago, where he repeatedly told of his cure. Chief editor, Maurice Fishbein of the ‘AMA’ journal heard the news, contacted the man and discovered where he had been cured. (Because the College of Medical Evangelists had repeatedly ignored Ellen White and had actively sought out AMA membership of the highest rating, the CME graduate, R.T. Hamer, was naturally an AMA member.) Fishbein threatened Hamer with removal from the AMA, and rather than lose that ‘prestige’, Hamer stopped using Rife’s technology to ‘cure’ his patients. By the 1930s the AMA was also relentlessly attacking Hoxsey and his vegetable cure for cancer in U.S. courts. Finally the U.S. Congress was involved, and investigated the AMA, finding it to be a ‘labor union’ (such as SDAs have advice from Ellen White to NOT join). But when Fishbein’s AMA efforts began lagging against fighting real advances in cancer treatment, the FDA picked up the attack on people like Rife and Hoxsey, who finally left the U.S. I tried to find a video on a website outside of the states, that best covers Rife’s, Hamer’s and Hoxsey’s story, so I could link it here, but ran out of time. You can do your own Google search if you are interested. Apparently, there are 2 other obstacles to curing disease in the United States – the AMA and the FDA (it’s U.S. Government ‘branch’) – and the SDA doctors of the College of Medical Evangelists chose to support both obstructionist organizations from the time of ‘Loma Linda’s’ founding, just as real progress was being made in fighting cancer and other diseases, well over a century ago.
. . . What’s wrong with this picture ? Someone said that a formally accepted and widely available cancer cure is not possible because there are more people living from cancer in the wider sense (think research,medical establishment, insurance …) than dying from it. That may be one of the explanations of why in spite of huge efforts and bright researchers so many still die. And then there is BigPharma that certainly invests money in research aiming to find “treatment” drugs, but never “cure” drugs. The latter would save lives but would also destroy their trillionary businesses. Thus, they have to go the other way around. Unending treatment guarantees their profit!